Provenance studies have become rather popular lately.1 In these studies, the types of grains or rocks within a formation are analyzed, and the original outcrop location “upcurrent” is determined. This in turn can provide the minimum transport distance, and the path of the particle is reinforced by paleocurrent indicators in the sedimentary rock. These indicators are typically abundant in sandstones and conglomerates. Figure 1. 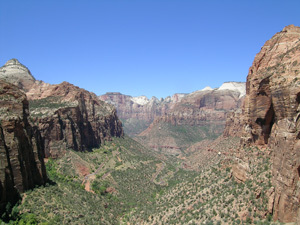 Pine Creek Canyon, which intersects Zion Canyon in the distance, in Zion National Park, south central Utah, USA. Most of the vertical walls are the massive Navajo Sandstone (view west from Canyon Overlook). The ubiquitous distribution of such gravel beds, the distance of transport from the nearest source upcurrent, the location of the source across present day mountain ranges or continental divides, the number and size of clasts transported, and the deposition of gravel beds on plateaus or mountain tops strongly suggests that the water responsible for these deposits was the enormous water runoff from Noah’s Flood, rather than the uniformitarian explanation of rivers. Based on modern observations, rivers do transport rocks, but do not deposit them over wide areas. Seldom do they have the current velocity to carry larger rocks long distances. Although empirical provenance studies are beneficial to diluvial interpretation, uniformitarian assumptions and methods call others into question. An interesting conclusion of such studies is the suggestion that the grains of the Navajo Sandstone on the Colorado Plateau originated from the Appalachian Mountains.11 The Navajo Sandstone is one of the largest supposedly wind-deposited formations in the geological record and is estimated to have once covered up 400,000 km2, the size of the state of California.12 It reaches a thickness of 670 m in Zion National Park (figure 1) and thins eastward. Moving such a volume of sand all the way across North America would require large, powerful currents. Flood currents are a better explanation than rivers, especially for a really widespread deposits of large clasts that have been carried long distances. Provenance studies of sandstones other than the Navajo Sandstone on the Colorado Plateau have also concluded that some of the sand originated in the Appalachians.17,18 Even some sandstones north of the Colorado Plateau, in southwest Wyoming and southeast Idaho, are thought to be of Appalachian origin. Paleocurrent data shows that these sands were transported from the north and northwest,19 but finding a source for so much sand north of the plateau has proven challenging. Some geologists think the source was as far away as Canada. The theory that the source was the Appalachians is largely based on the 950–1,250 million-year age for about half of the zircons, which suggests that they were eroded from the Grenville Province of the basement, just west of the Appalachians. If true, that would mean that these sands were transported between 1,000 and 2,000 km to a location just north of the Colorado Plateau. Much of the Late Precambrian to Cambrian sediments in the western United States and northwest Mexico are also believed to have originated in or near the Appalachians.20 If true, those mountains would have been higher than the Himalayas to have supplied such a volume of sediment. What do these provenance studies mean? Figure 2. 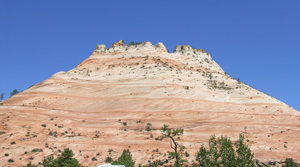 Multiple bounding surfaces, represented by the horizontal lines, that truncate cross-beds in the Navajo Sandstone, Zion National Park, Utah. The zircon-dating provenance studies indicate very long distance transport. Although uniformitarian scientists invoke rivers to carry these grains, few rivers in the world are 2,000 km long. Even if they were, could those rivers have really moved such vast quantities of sediment that distance? Although modern rivers carry heavy sediment loads, they do not move sand grains over such distances in such quantities. This seems to be another example of the breakdown of uniformitarianism. Nor can creationists blithely accept the zircon dates as a firm basis for deducing the original outcrops. A map of basement rock dates across North America shows trends that are interpreted as discrete tectonic terranes, but we are left with the problem that has plagued radiometric dating for decades. Since “bad” dates are usually not reported, we have no way of assessing the reality of even relative trends shown by these dates. And of course since basement rocks are classified stratigraphically by their radiometric dates,21 an empirical basis for assessing these trends remains uncertain. Even if the studies showing these vast transport distances are right, they would seem to provide additional evidence for the Flood, which could easily account for large-scale, high-velocity currents. Flood currents are a better explanation than rivers, especially for a really widespread deposits of large clasts that have been carried long distances. In addition, these Flood currents support the other evidence that suggests that the “eolian” sands of the southwestern United States were actually deposited by aqueous means. For example, the sandstones have flat upper and lower contacts, sometimes grade horizontally or vertically into marine sedimentary rocks, and contain ubiquitous bounding or truncation surfaces (a type of planation surface) that shears off cross-beds (figure 2). Uniformitarians also face other problems, such as the need to maintain consistent paleocurrent directions (south onto the Colorado Plateau) for 100 million years. That seems to be a long lifespan for an average wind system! 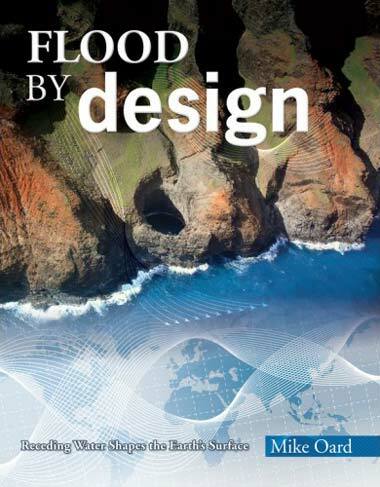 Reed, J.K. and Froede, Jr, C.R., Provenance studies of clastic sediments and their role in a hydrodynamic interpretation of the Genesis Flood, Creation Research Society Quarterly (in press). Return to text. Oard, M.J., Hergenrather, J. and Klevberg, P., Flood transported quartzites—east of the Rocky Mountains, Journal of Creation 19(3):76–90, 2005. Return to text. 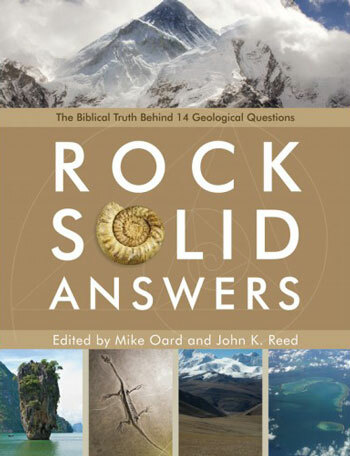 Oard, M.J., Hergenrather, J. and Klevberg, P., Flood transported quartzites: part 2—west of the Rocky Mountains, Journal of Creation 20(2):71–81, 2006. Return to text. Oard, M.J., Hergenrather, J. and Klevberg, P., Flood transported quartzites: part 3—failure of uniformitarian interpretations, Journal of Creation 20(3):78–86, 2006. Return to text. Oard, M.J., Hergenrather, J. and Klevberg, P., Flood transported quartzites: part 4—diluvial interpretations, Journal of Creation 21(1):86–91, 2007. Return to text. Oard, M.J., Long-distance Flood transport of the Nenana Gravel of Alaska—similar to other gravels in the United States, Creation Research Society Quarterly 44(4):264–278, 2008. Return to text. Froede Jr, C.R., Neogene sand-to-pebble size siliciclastic sediments on the Florida Peninsula: Sedimentary evidence in support of the Genesis Flood, Creation Research Society Quarterly 42:229–240, 2006. Return to text. Steward, J.H., Gehrels, G.E., Barth, A.P., Link, P.K., Christie-Blick, N. and Wrucke, C.T., Detrital zircon provenance of Mesoproterozoic to Cambrian arenites in the western United States and northwestern Mexico, GSA Bulletin 113, p. 1343, 2001. Return to text. Rahl, J.M., Reiners, P.W., Campbell, I.H., Nicolescu, S. and Allen, C.M., Combined single-grain (U–Pb)/He and U/Pb dating of detrital zircons from the Navajo Sandstone, Utah, Geology 32:761–764, 2003. Return to text. Pratt, S., Tracing the Navajo Sandstone, Geotimes 48(11):6–7, 2003. Return to text. Ireland, T.R., Flöttmann, T., Fanning, C.M., Gibson, G.M. and Preiss, W.V., Development of the early Paleozoic Pacific margin of Gondwana from detrital-zircon ages across the Delamerian orogen, Geology 26:343–346, 1998. Return to text. Berry, R.F., Jenner, G.A., Meffre, S. and Tubrett, M.N., A North American provenance for Neoproterozoic to Cambrian sandstones in Tasmania? Earth and Planetary Science Letters 192:207–222, 2001. Return to text. Rainbird, R.H., Heaman, L.M. and Young, G., Sampling Laurentia: detrital zircon geochronology offers evidence for an extensive Neoproterozoic river system originating from the Grenville orogen, Geology 20:351–354, 1992. Return to text. Rainbird, R.H., Stern, R.A., Khudoley, A.K., Kropachev, A.P., Heaman, L.-M. and Sukhorukov, V. I., U–Pb geochronology of Riphean sandstone and gabbro from southeast Siberia and its bearing on the Laurentia—Siberia connection, Earth and Planetary Science Letters 164:409–420, 1998. Return to text. Dickinson, W.R. and Gehrels, G.E., U–Pb ages of detrital zircons from Permian and Jurassic eolian sandstones of the Colorado Plateau, USA: paleogeographic implications, Sedimentary Geology 163:29–66, 2003. Return to text. 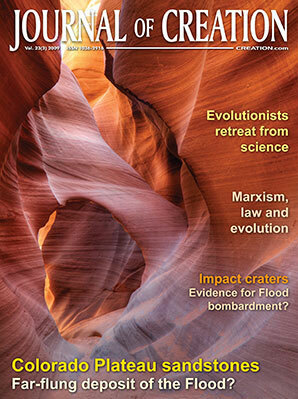 Dickinson, W.R. and Gehrels, G.E., U–Pb ages of detrital zircons in Jurassic eolian and associated sandstones of the Colorado Plateau; evidence for transcontinental dispersal and intraregional recycling of sediment, GSA Bulletin 121:408–433, 2009. Return to text. Baars, D.L., The Colorado Plateau: A Geologic History, revised and updated, University of New Mexico Press, Albuquerque, NM, 2000. Return to text. Steward et al., ref. 10, pp. 1343–1356. Return to text. Reed, J.K., Toppling the timescale Part IV: assaying the golden (FeS2) spikes, Creation Research Society Quarterly 45(2):81–89, 2008.